People using a laptop often want to download all their email to their laptop before starting a journey so they can work with their email without a connection to the Internet. Microsoft Outlook’s “Offline” mode allows Outlook to be used without an Internet connection, but it doesn’t automatically download all your email to your laptop so it’s available whenever you want. 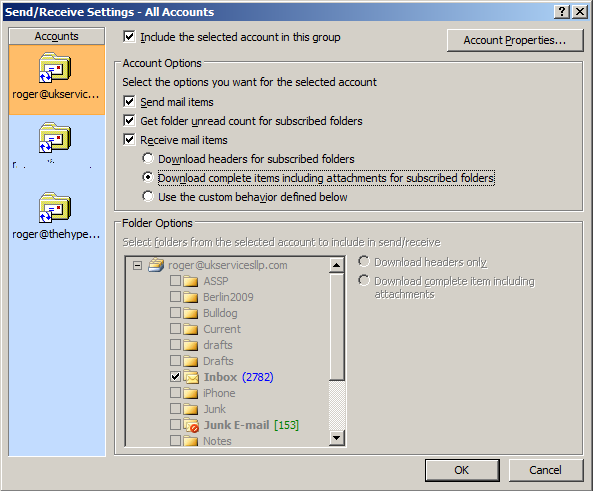 To do this you must adjust various settings in Outlook to force it to download everything from your mail server onto your computer. Using Outlook like this can reduce the amount of time it takes to move between Outlook’s folders, and means you can always read and file your mail, even when your computer is not connected to the Internet. Unfortunately, it’s not easy to find the relevant settings in Outlook, so getting Outlook to work in Offline mode is not particularly straightforward without a little help from someone that’s done it before. Now tick the various options and tick boxes so that Outlook works exactly the way you want it. Most people will probably want to select “Download complete items including attachments for subscribed folders”. Note that if you have a large mail file, Outlook might take 24 hours to download all your email when you adjust this setting. Once it has done this Offline mode will work as expected. This article was published on Thursday, December 23rd, 2010 at 12:52 pm. You can follow any responses to this article through the RSS 2.0 feed.